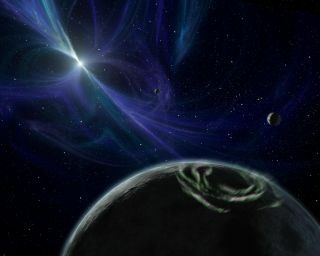 This artist's illustration shows the three known planets orbiting the pulsar PSR B1257+12. The two outermost planets, now officially named Poltergeist and Phobetor, are the first confirmed exoplanets; their discovery was announced in January 1992. The pace of discovery skyrocketed after the launch of NASA's Kepler space telescope in March 2009. Kepler detects exoplanets by noting the tiny brightness dips that orbiting planets cause when they cross their hosts stars' faces from the spacecraft's perspective. To date, Kepler has found 2,330 confirmed alien worlds using this "transit method" — about two-thirds of the 3,500-odd exoplanets known. Kepler's observations also suggest that, on average, every star in the Milky Way galaxy hosts at least one planet. Furthermore, a sizable percentage of these trillion or so worlds are likely in their star's "habitable zone" — the just-right range of distances where liquid water could exist on a planet's surface. So now, just a quarter-century after exoplanet science got its start, astronomers are racing to make epochal discoveries in the field — the first true "alien Earth," and, perhaps, evidence that our planet is not the only one that supports life.